These points are on a constant VSWR arc but the arc has not been draw because the two arcs would overlap and might be confusing to some readers. The impedance is normalised to 50Ω and plotted on the Smith chart, point 3 above. A radial from the centre through point 3 is drawn to the edge of the chart. Another radial is drawn a distance towards the generator of 0.175λ and using a pair of dividers or ruler, point 4 is plotted on that radial at the same distance from the centre as point 3. It is clear that the predicted R value of the points 2 and 4 are very different and will be sufficient to differentiate the +ve and -ve X cases. Reading of the normalised R value for each and multiplying it, we get R=52Ω for point 2 (the +ve X case) and R=30Ω for point 4 (the +ve X case). 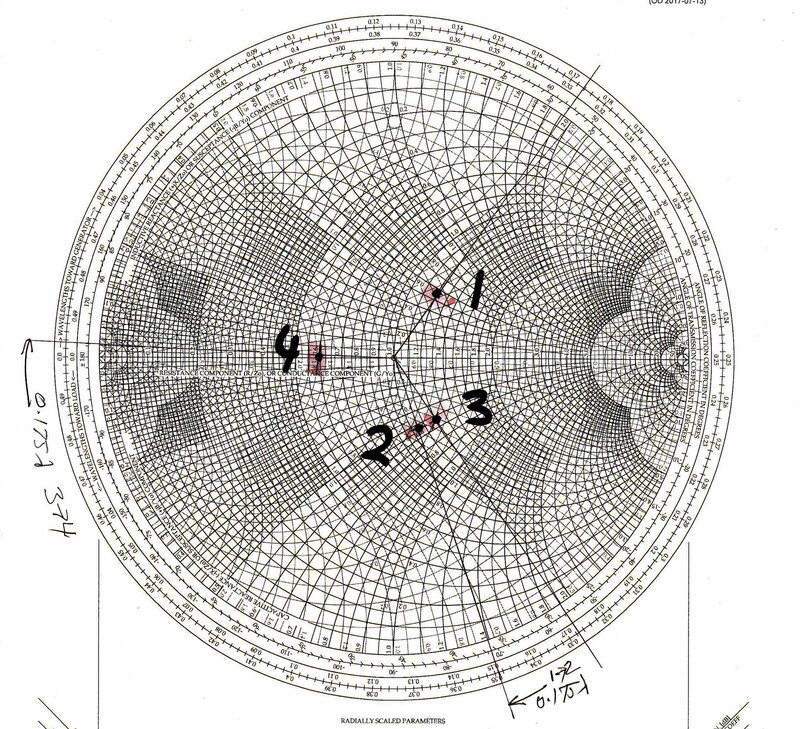 The predicted R values of 52Ω and 30Ω are very slightly different to the more exact values using in the original article a good transmission line calculator because the Smith chart solution above is for a lossless line, and being a graphic solution is it not as precise as the mathematical one. 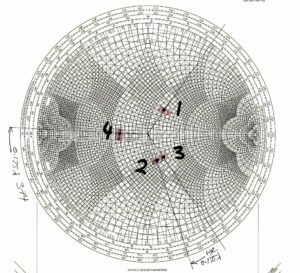 Nevertheless, the Smith chart solution is quite good enough to differentiate the two possibilities and to show that the sign of X in the original measurement is in fact -ve.